Alison Steadman, OBE (born 26 August 1946) is an English actress. She won the 1991 National Society of Film Critics Award for Best Actress for the Mike Leigh film Life is Sweet, and the 1993 Olivier Award for Best Actress for her role as Mari in the original production of The Rise and Fall of Little Voice. In a 2007 Channel 4 poll, the "50 Greatest Actors" voted for by other actors, she was ranked No. 42. Steadman made her professional stage debut in 1968 and went on to establish her career in Mike Leigh's 1970s TV plays Nuts in May (1976) and Abigail's Party (1977). She received BAFTA TV Award nominations for the 1986 BBC serial The Singing Detective, and in 2001 for the ITV drama series Fat Friends (2000–05). Other television roles include Pride and Prejudice (1995), Gavin & Stacey (2007–10) and Orphan Black (2015–16). Her other film appearances include A Private Function (1984), Clockwise (1986) Shirley Valentine (1989), Topsy Turvy (1999) and The Life and Death of Peter Sellers (2004). Steadman was born in Liverpool, the youngest of three sisters born to Marjorie (née Evans) and George Percival Steadman, who worked as a production controller for Plessey, an electronics firm. Steadman was educated at Childwall Valley High School for Girls, a state grammar school in the Liverpool suburb of Childwall, followed by East 15 Acting School, to which she secured a place in the autumn of 1966 and where she met Mike Leigh during her second year. Having left the East 15 Acting School in Loughton, Essex, Steadman worked in various regional repertory theatres, starting at Lincoln in 1968, where her first role was that of the seductive schoolgirl Sandy in The Prime of Miss Jean Brodie. She created the role of the monstrous Beverly in Mike Leigh's Abigail's Party, which she reprised with the original cast on television. She won an Olivier Award for The Rise and Fall of Little Voice, and also appeared in Cat on a Hot Tin Roof, Entertaining Mr Sloane, Hotel Paradiso, and others in locations as diverse as the Royal Court, the Theatre Royal, the Old Vic, the Hampstead Theatre, the Nottingham Playhouse, the Everyman Liverpool and the National Theatre. She starred as Elmire in the 1983 RSC production of Molière's Tartuffe, which was adapted for BBC television. In 2010, Steadman was cast as Madame Arcati in a revival of Noël Coward's Blithe Spirit, which was scheduled for a national tour from November 2010 to March 2011. In 2014, Steadman appeared as Madame Raquin in Helen Edmundson's adaptation of Emile Zola's Therese Raquin. Steadman has appeared in many films, including P'tang, Yang, Kipperbang (1982), Champions (1983), A Private Function (1984), Number One (1985), Clockwise (1986), Stormy Monday (1988), The Adventures of Baron Munchausen (1988), Shirley Valentine (1989), Wilt (1989), Life Is Sweet (1990), Blame It on the Bellboy (1992), Secrets & Lies (1996), Topsy-Turvy (1999), The Life and Death of Peter Sellers (2004), Confetti (2006) and Burn Burn Burn (2015). 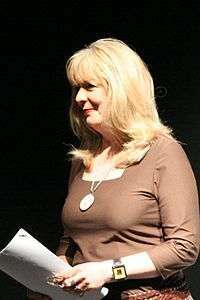 Steadman's television work includes Fat Friends as Betty, Grumpy Old Women, Stressed Eric, Let Them Eat Cake, The Singing Detective, No Bananas, The Caucasian Chalk Circle, Adrian Mole: The Cappuccino Years as Pauline Mole, opposite James Bolam in the television film The Missing Postman and Pride and Prejudice as Mrs. Bennet. In 1991, she also appeared as Edda Göring in Selling Hitler and as Lauren Patterson in Gone to the Dogs, which was then followed up by Gone to Seed. Television productions directed by Leigh in which she has appeared include Nuts in May, Hard Labour and Abigail's Party. She also appeared in the BBC comedy The Worst Week of My Life. In 2007 she featured in the BBC Wales programme Coming Home about her Welsh family history, with roots in Trefarclawdd and Ruabon. From 2007 to 2009, she appeared in the BBC comedy Gavin & Stacey as Pam Shipman. She was also in Fanny Hill on BBC Four in 2007. Steadman starred with Myra Frances in Girl, a 1974 BBC play in the Second City Firsts series, performing the first lesbian kiss on British television. On radio, Steadman's talent for mimicry and character voices was given full rein in shows such as Week Ending, Castle's on the Air and The Worst Show on the Wireless, in both the latter of which she played the over-protective mother to Eli Woods' long-suffering Bunty/Precious. From 1982 to 1984, she joined Eli Woods and Eddie Braben (Morecambe and Wise's scriptwriter) in the UK radio show The Show with No Name for thirteen episodes, in what can be described as an updated version of Round the Horne comedy sketch show. More recently, since 2002, she has starred as Mrs Naughtie in the series Hamish and Dougal. In December 2009, she starred in the late Mike Stott's 'My Mad Grandad' on BBC Radio 4. In Manchester in 1972, shooting his television film Hard Labour, director Mike Leigh drove over to Liverpool to see Ted Whitehead's play The Foursome, (Steadman was in the Liverpool Everyman cast). He asked Steadman to be in his film. "During the preparation of the film, Mike and Alison, as they both say, 'got together.' " They married in 1973 and had two sons, Toby (born February 1978) and Leo (born August 1981). The couple separated in 1995 and divorced in 2001. Steadman's present partner is Michael Elwyn and the couple live in Highgate, London. Steadman and other celebrities, including Tom Hiddleston, Jo Brand, E. L. James and Rachel Riley, designed and signed cards for the UK-based charity Thomas Coram Foundation for Children. The campaign was launched by crafting company Stampin’ Up! UK and the cards were auctioned off on eBay during May 2014. ↑ "The Stage Talk". The Stage. Retrieved 17 September 2014. ↑ Bamigboye, Baz (16 July 2010). "From Spooks to a seance". Daily Mail (Associated Newspapers). ↑ Alison Steadman. "The Alison Steadman Page". Pandp2.home.comcast.net. Archived from the original on 16 July 2007. Retrieved 2012-05-23. ↑ Archived 11 January 2005 at the Wayback Machine. ↑ Rebecca Pocklington (6 May 2014). "Benedict Cumberbatch, Tom Hiddleston, Jo Brand and more celebrities design and sign cards for UK's first children's charity". Mirror Online. Retrieved 7 May 2014.